Good choirs know how to blend several musical parts and have the ability to blend in a balanced manner. Intonation, diction, rhythm and balance are all essential elements of a good choir performance. The conductor is responsible for shaping the music while the performers are responsible for knowing their parts and singing in-tune. 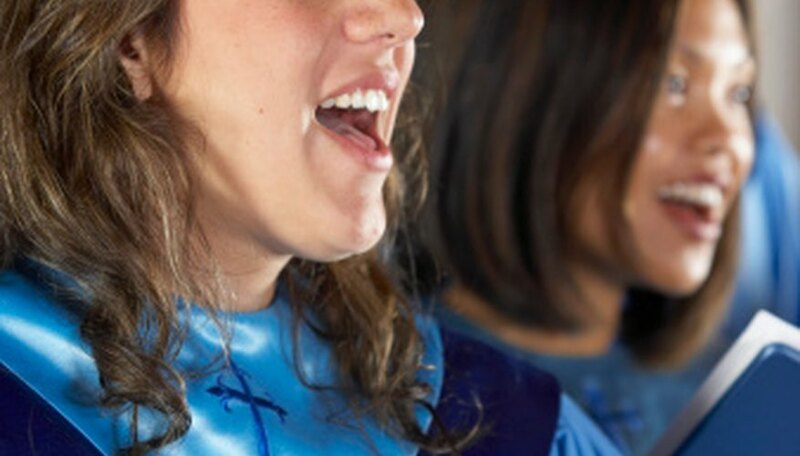 Intonation is the ability to sing in-tune with other members of the choir. The choir director will provide the first pitch either by use of a piano or through a pitch pipe. Each choir member must then listen to each other and sing on the same pitch as other members of their section. A choir that is out of tune will sound weak and unable to provide a high-quality sound. When a choir sings out of tune interference beats sound in the music. Members of the choir must constantly adjust to avoid hearing these beats. Diction is just as important as intonation. Without proper diction, vowels and consonants are unintelligible to the audience. Individual choir members must agree as a group on the proper way to pronounce words. The choir director should aide in this process by modeling the proper way to pronounce each word. For the most part, if each choir member has studied diction, rehearsal time will focus on fixing only unusual words. Rhythm is extremely important for a quality choir. If one section is singing behind the rhythm, it will be extremely noticeable. One member of the choir can ruin an otherwise perfect performance if they exhibit poor rhythm. When an individual singer sings differently than the rest of the group she will stand out and convolute the overall choir sound. Many amateur choirs will practice just the rhythm of a piece before singing the actual notes. If the tenors in a choir overpower the sopranos, it will affect the balance. This is true for any section that is unintentionally more powerful than other sections. Choir directors have to shape the overall sound and teach the performers to sing in a balanced and blended manner. Holding individual notes and adjusting each section until the proper balance occurs is one method to correct this. Once the choir achieves the correct balance, the conductor can test them by having them stop singing and then come back in on the same section. Steven Miller graduated with a master's degree in 2010. He writes for several companies including Lowe's and IBM. He also works with local schools to create community gardens and learn environmentally responsible gardening. An avid gardener for 15 years, his experience includes organic gardening, ornamental plants and do-it-yourself home projects.